You're about to learn WAYYYYY more about pizza than you ever knew. And then immediately go to Posto to check it out. That's my plan. 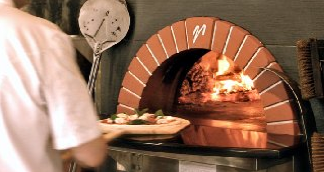 Executive Chef/Owner Joe Cassinelli is excited to announce that Posto in Davis Square has just been certified by the AVPN -- Associazione Verace Pizza Napoletana, as an “official Neapolitan pizzeria” – the only such restaurant to pass and receive certification in New England, including Boston. This past month, Giulio Adriani, travelled from Naples, Italy to ‘inspect’ Posto Chef Cassinelli’s technique and execution of Neapolitan pizza. After some serious and grueling tests, it was determined that Posto would in fact pass the certification process --the very first in the area! "Associazione Verace Pizza Napoletana" ("True Neapolitan Pizza Association"), which was founded in 1984 and only recognizes the Marinara and Margherita verace, has set the very specific rules that must be followed for an authentic Neapolitan pizza. These include that the pizza must be baked in a wood-fired, domed oven at 485°C for no more than 60 to 90 seconds; that the base must be hand-kneaded and must not be rolled with a pin or prepared by any mechanical means (i pizzaioli — the pizza makers — make the pizza by rolling it with their fingers) and that the pizza must not exceed 35 centimetres in diameter or be more than one-third of a centimetre thick at the centre. The association also selects pizzerias all around the world to produce and spread the verace pizza napoletana philosophy and method. Congrats to Posto! Save me a slice. 0 Response to "Certified Neapolitan Pizza @ Posto"